These dishes will keep you and your tummy warm for sure! For the full schedule and menu, head over to the Farmers Market page. Now, back to Christmas — It’s known that in Japan, KFC chicken is popular during Christmas. Some people say it is because Colonel Sanders has a passing resemblance to Santa Claus or it was an old marketing strategy to align that image with KFC and it just stuck. We were inspired by this tradition, and just opened pre-orders of our famous Laotian Fried Chicken aka L.F.C. (pickled chili, fried shallots, roasted peanuts, kaffir lime) for you to enjoy for the holidays. We have all sizes for your needs, a personal meal, bucket size (limited time only), and our catering pans for large parties. 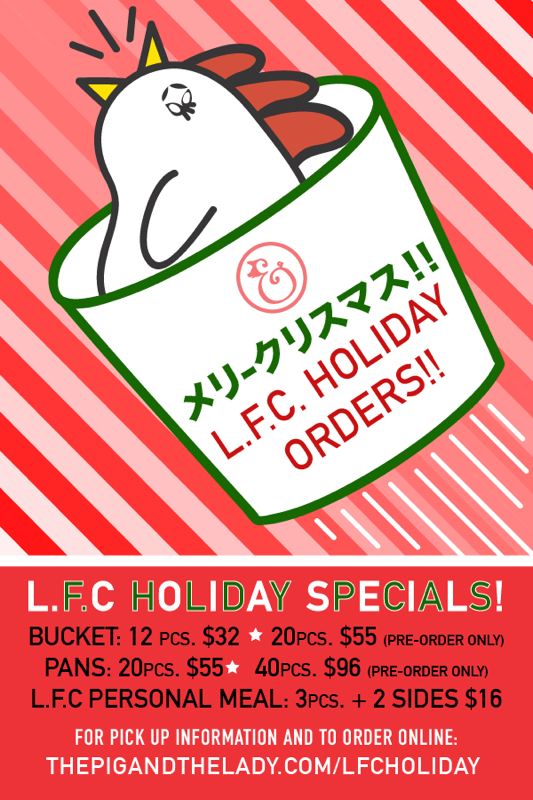 Buckets and pans are pre-order only and will end on Friday, 12/22 at 6pm. The personal meals will only be available at the KCC Farmers Market this Saturday, December 23 from 7:30am-11am. For the L.F.C. bucket, ranging from 12 to 20 pieces, will also be available for pickup on Saturday morning at KCC. For catering pans of 20 to 40 pieces, pre-order now and pick up at either location, The Pig and the Lady in Chinatown and Piggy Smalls at Ward. Photo by Eat Rice Hawaii. For more details and to make your pre-orders now, go to our L.F.C. Holiday Order page.